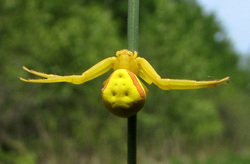 Goldenrod Crab Spiders are found around Richmond, Virginia. They are usually white with red stripes, but can change their color to yellow. The Crab Spider is named for its resemblance to a crab, and the way that it moves. They typically inhabit gardens where yellow or white flowers abound, so that they can camouflage themselves from their prey. They do not build webs, but hunt insects that land on flowers such as bees and butterflies. These spiders are rarely seen inside homes. Click here to find out more about the Grass Spider!